Recipes | . :Rocky Hollow Gardens:. 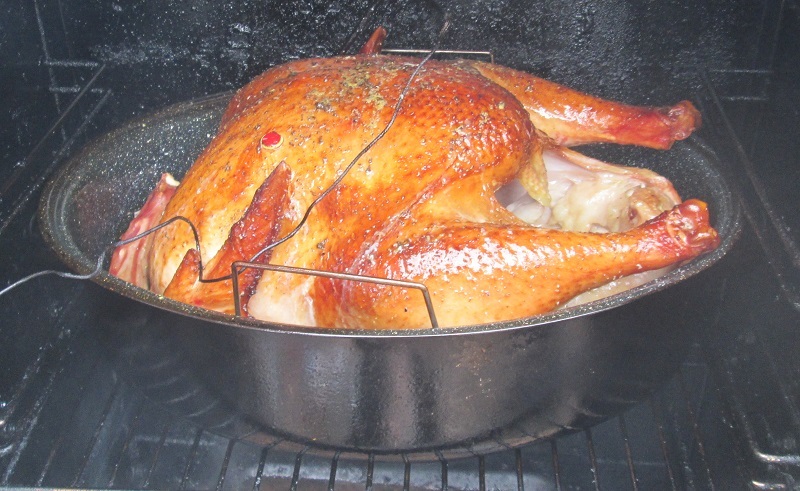 I can’t wait till we are smoking our own home raised turkeys to feast on during the holidays, that is the plan for next year. So for this turkey I rubbed the outside of the turkey with olive oil, sage and thyme, then injected garlic-turmeric infused butter into the meat whenever we’d go out to baste it. Turned out amazing, super juicy, tender and smoked to perfection. This picture was taken right after I picked the carcass clean of the choice meat. 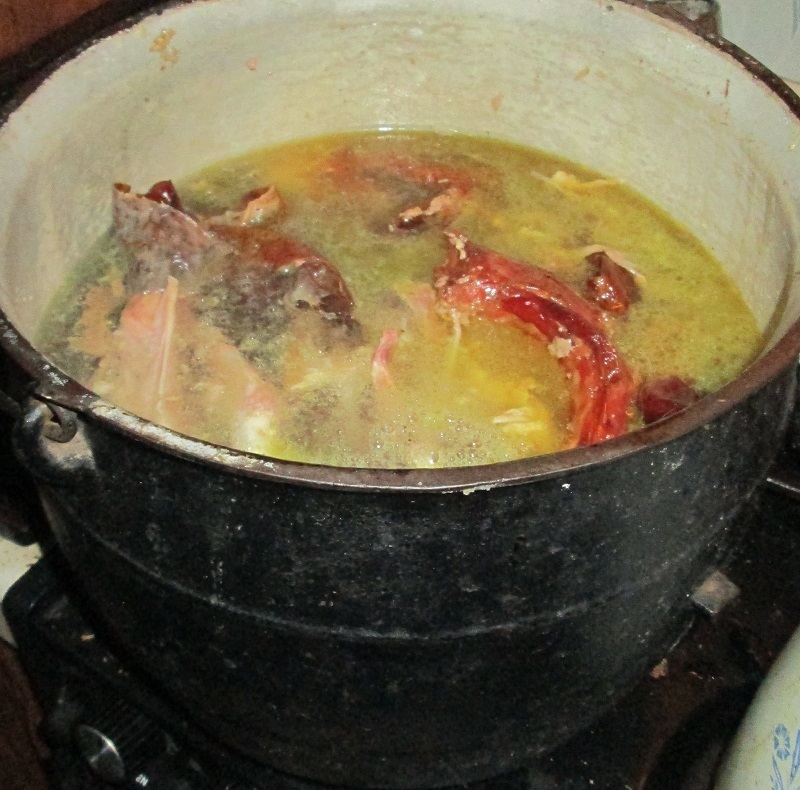 The remaining meat and bones when in here, including the neck, gizzard, liver and heart. After picking all the choice meat off the bones I put all that was left in my cast iron stock pot, covered with water, added in 1/2 cup ACV and will let it simmer for 12 to 24 hours. I am amazed at how using the bones in this way makes the best soup stock I’ve ever had, and how since we have moved out here all 6 of us have been enjoying vibrant health. None of us has been sick at all, and that is saying something. When we lived in Oregon, before I learned to do the many nourishing traditions I have learned during this time, we’d have colds, flu and all kinds of bugs sweep through our family several times per year. Now, nada. It takes a while to sift through all the turkey debris in the stock to fish out the bones, but the soup is SO worth it. Added veggies, noodles, onions, garlic and a bit of the left over mashed potatoes from last night and wah-la! Turkey Noodle Soup is served! Sweet Potato Cookie Recipe, and Happy Thanksgiving! This is our 2nd Thanksgiving in Missouri, and our first at home doing our own thing. I am thrilled to be creating traditions now that will reverberate each holiday season from here on, and hopefully pass down to my children. Here is what we are up to. optional: you can add 1/2 cup raisins and 1/2 pecans, I don’t. Pumpkin, cut into chunks and baked in my dutch oven for about 40 minutes, when you can smell pumpkin cooking it’s time to test it. When the fork easily pierces the flesh it’s done. Scooping the pumpkin meat off of the skins, comes off super easy. Straining out the excess water of the pumkin mush. I let it drain overnight. Here it is the next morning, ready for the rest of the ingredients. In the oven. Pie crust was also made from scratch. In a separate bowl I added the ingredients listed above and mixed well. Then I set mixture aside, preheated the oven to 425ºF and began on the pie crusts. In a large mixing bowl mix together salt and sugar. Add lard/tallow and break it up with a pastry cutter as you start to coat it all up with flour 1 cup at a time till it gets crumbly, then add the rest of the flour. Add in the cubed cold butter and work it into the flour with hands or pastry cutter. Work quickly before butter softens, work it till it’s crumbly. Add ice water a 1/4 cup at a time mixing until dough forms, work into a ball. When it comes together stop working the dough or it will get tough. Divide dough in half and flatten it slightly to form a disk. Wrap each disk in plastic wrap or wax paper and refrigerate for 30 minutes. On a floured surface roll each disk out into a circle about 1/4 to 1/2″ thick, 1o to 11″ wide to make a 9″ pie. I used my round cake pans to bake these in, as I don’t have pie dishes yet. I put the crust in the pan, made sure it was gently stretched/pressed into the corners and then added the filling to 2/3 full. Then I trimmed off the excess crust around the edges, and put them in the oven. I baked the pies for 15 minutes at 425ºF before lowering the oven temperature to 300ºF for the remaining 40-60 minutes. You want to cook the pies till a toothpick or butter knife comes out practically clean. mmmm… they turned out perfect, not so purdy, but will do the job. Now I plan to let the pies cool, and freeze them till Thanksgiving. Done! I am giving my thanks to the most beloved people in my life through cooking us up a feast this Thanksgiving, so we can share good grub and make memories together this holiday season. I’m thankful for my desire and inspiration of keeping my family healthy, and my growing knowledge of yummies I am able to make for them. I’m thankful for how I find myself creating delicious health art in the kitchen for us/them to nourish with and enjoy! Even the treats I make with trusted ingredients from scratch, which gives me a satisfaction that is indescribably alluring to keep me at it each day. It is my pleasure to accomplish new nourishing baking skills and learn through trial and error each day. I love that we are the kind of family where my kids are growing up on a 99% from-scratch-diet, where my children see and help their mama prepare and make daily nourishing traditions for them. I’m thankful to be learning and sharing these traditional skills that my children can someday hand down to their own children and grandchildren that will enrich all our lives with vibrant health for generations to come. One 3.75 lb rabbit made a stew that will feed us 3 times, I was able to store 2 meals worth of stew in the freezer for future dinners after eating a big helping the first night. Recipe: I started first thing in the morning, took my big stock pot, put the dressed rabbit (bones and fat intact) in the stock pot, filled the pot with water and 1/4 cup of raw apple cider vinegar, and one coarsely chopped medium red onion and about 10 cloves of garlic, chopped and smashed. I put the flame on med-high till it began to boil, stirring occasionally. Then I turned the heat down to low and let it slow cook all day, half the day with the cover on. By early evening (around 4pm) the meat was falling off the bones nice and easy, so I picked out all the bones, added chopped carrots, celery, chopped potatoes, a cup of rice and some noodles. Then I added salt, pepper, turmeric, parsley, a pinch of rosemary and let the noodles and rice finish becoming tender. 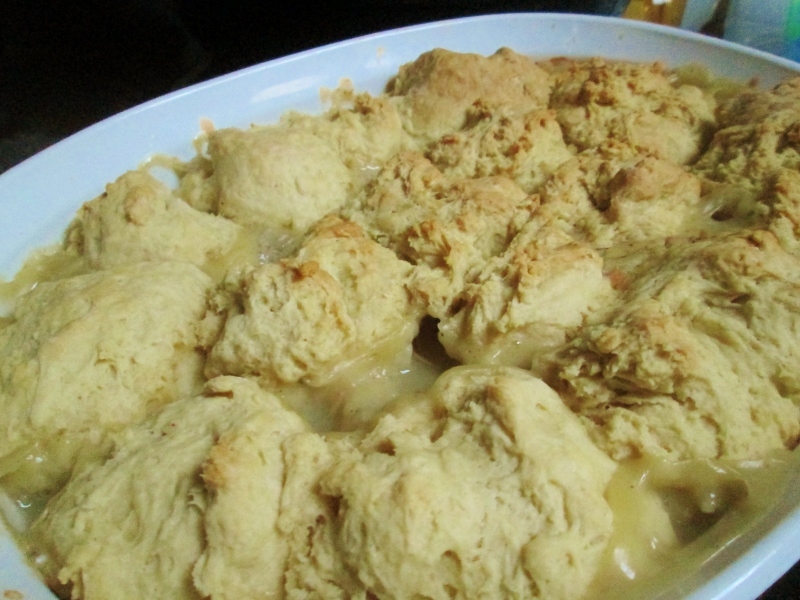 Then I threw together some from scratch biscuits. This time of year homemade soup stock is so healing and great for the immune system, I love homegrown! Here is a picture of the stew I made out of the rabbit soup. Put your cupcake liners into the cupcake pan. Shred peel from 1 orange; researve. Squeeze juice from all oranges. Measure 3/4 cup juice, 1 teaspoon of the peel, egg, and oil, mix well in a medium bowl. In a separate large bowl, stir together flour, sugar, baking powder, salt and baking soda. Add in orange mixture, stir till just evenly moistened. Turn into cupcake pan, filling each cup 2/3 full. Bake 20-30 minutes, check with toothpick till it comes out clean. blend 1 tablespoon of reserved orange juice and the rest of the orange peel with powdered sugar. Add more juice to make of drizzeling consistency.